I Developed UniGoogleMap component for uniGUI. important: must be install veriosn uniGUI ver 0.87.0.901 or later. This component is a subclass of TUniHTMLFrame. So i write a Objective Class for using GoogleMap API (files\GMap.js). This Class uses a third party Class (markerwithlabel.js). Attention: when you put this component on the form first set MapName property. If you want use multiple Map on your project, must be set unique name for this property. After Install this component add in [uniGUI Additional] section of uniGUI components. I add many future as soon as. Many Thanks to Mr. Farshad for this usefull framework. Attention: when you put this component on the form first set MapName property. If you want use multiple Map on you project, must be set unique name for this property. 1) Use multiple Google Map on project. 2) Add multiple Marker and move them. 3) Use Delphi methots for create and add Map and Marker. I have not used it yet, but whatever thanks for the contribution. I'll use it and I will comment about that later. Thanks for your contribution. I also added a new demo called GoogleMaps which is available in recently uploaded build 886. I'm sure it will give you more ideas to further enhance and develop your component. BTW, is map location fixed or can it be changed from Delphi? I will change source for dynamic location map. I will put new version in one hour later. * Add Default Latitude and Longitude Map Location. * Add Save Last Zoom, Last Latitude and Longitude Map Location. * Fixed bug with zoom in & out problem. I have installed the component and test samples. But it does not show how to do it. I think you not set correct ExtRoot path in ServerModule ! not works . Help me please. file or files ? folder . It should be "files" folder. You right, i fix it now ! * Remove Extra syncode unit. 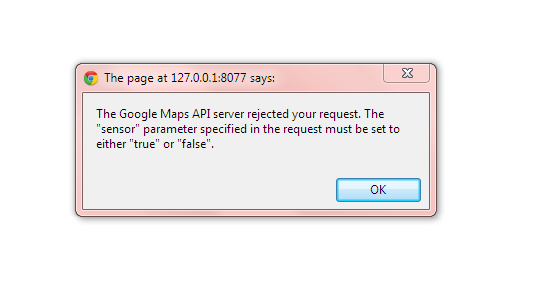 3 demo is not work not show google map . Error code TwoMap: 00000834: 22:23:54CommandGet:EUniSessionException : Invalid session or session Timeout. I installed it I was wrong. Get used to it. Probably the GMap.js cached by your browser. press CTRL+F5 or clear browser caches. * Fixed multiple Map error. Thanks to Farshad from new release. Thanks to khachornsak for error comment. It works now. Have additional questions, I will change the Icon was also on display. 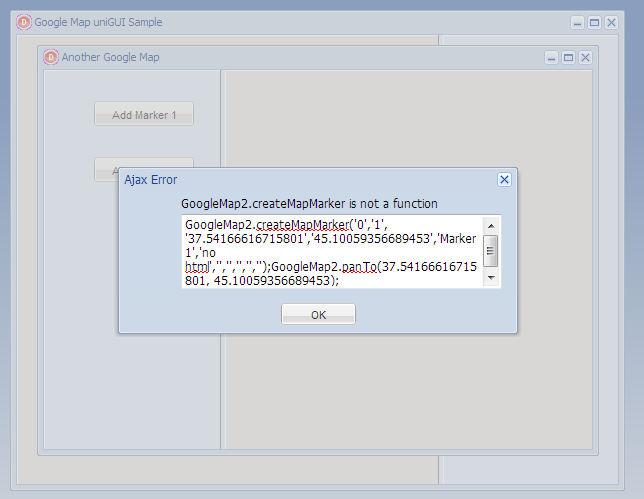 Thanks patmap, very usefull component.